Owning a home with a basement is a great opportunity to create a casual relaxing space. A basement rec room is one such possibility. You can work within the space you have. And depending on size and layout of the basement it can become a series of rooms such as an office, family room and laundry room like we have or if you prefer a open space, then you can do everything in one room. This includes relax, entertain, play pool , have a bar , media area with a home entertainment center and more all located within your basement rec room. Guys sometimes refer to this as their mancave. Ladies may not agree! You can make it rustic or fancy, but a more casual space that you can watch TV, listen to music, relax at the bar and overall chill in is what the focus of this page is all about. I am putting together a store with several links to offer everything you need to create the perfect baseement rec room in your home. Keep checking back because I will be adding categories to this as they develop. To start I am offering bar furniture, and bar tools for your enjoyment. 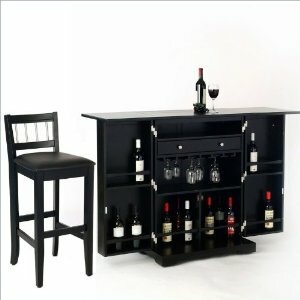 Included Items: Home Styles Furniture Steamer Ebony Folding Home Bar (Quantity: 1 Included ). Home Styles Furniture Manhattan 30 Inch Pub Stool in Black (Quantity: 2 Included ). Space-saving design meets sleek sophistication with the Contemporary Steamer Folding Bar! Easily transformed from a slat-panel door cabinet into a 3-section long rectangular bar, the Steamer doesn't come up short with a wealth of storage provided by four fixed door shelves and a central cabinet with single open shelf, utility drawer, stemware rack and two lower shelves. Brushed steel hardware and the versatility of a pure ebony finish complete the look and appeal of the Steamer Folding Bar. Features: Folding Bar has solid hardwood and engineered wood construction Polyurethane coat on top Folding bar has an ebony finish Six open shelves Stemware rack shelf Utility pull drawer with built-in drawer glides Brushed steel hardware Specifications: Closed bar dimensions: 41" H X 30" W X 19" D Open bar dimensions: 41" H x 60" W x 19" D FINDING THE RIGHT BAR FOR YOUR ENTERTAINING NEEDS! A trend that is quickly becoming popular today is home entertaining, and more and more people are coming up with ideas on simple, convenient, and sophisticated ways to entertain guests. Having a wine and spirits bar in a den or living room is now becoming a common application in designing rooms, especially in houses, lofts, and condominiums. The convenience of having everything in one place - from stemware to wine openers and accessories - has been a popular reason for this. There's no need to leave guests in the middle of a conversation to get something that could be easily within reach in the same room! Depending on the size of the room or the preferred bar size, there are options you may want to consider in choosing the right bar for your home. CONSIDER THE SIZE OF YOUR ROOM Check on the dimension of the bar itself and compare it with the space you are looking into placing it in. Make sure it fits the space properly. Product Description A great gift idea for those who love to entertain, this 11-piece barware set features all the bartending items needed for serving up a great party. The collection includes a 16-ounce cocktail shaker, a jigger, and a cocktail strainer with a comfortable finger rest and a raised lip to prevent liquids from dripping. The set also provides a mixing spoon, a smooth cutting board, and a citrus knife for slicing up lemons and limes, as well as a dual-function bottle opener that opens bottles and punches cans. A bar stand comes included to help keep the pieces neatly organized and readily available. 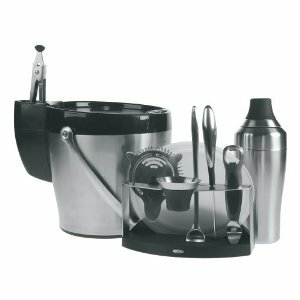 To round out the set, the collection includes a 4-quart ice bucket, ice tongs with a locking switch and sharp teeth for easily picking up ice cubes, and an ice-tong caddy that hangs off the side of the bucket for storing the ice tongs. Both the cocktail shaker and the ice bucket feature double-wall construction for enhanced insulation, and the ice bucket provides a non-slip base for stability and to protect tabletop surfaces. Thoughtfully designed, the barware pieces come equipped with soft-grip handles and brushed stainless-steel construction for comfort, long-lasting durability, and a look of refined beauty when displayed on any counter or bar. The sleek, curvy barware collection measures approximately 12-4/5 by 9 by 12-1/2 inches.